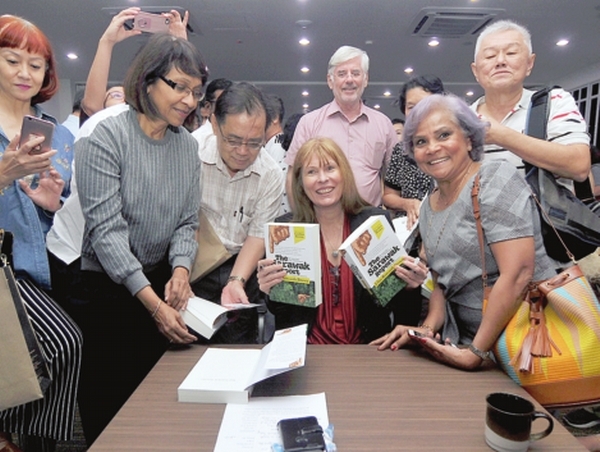 First print of Sarawak Report editor's book sold out | Daily Express Online, Sabah, Malaysia. Penang: The first print run of the Sarawak Report editor's book chronicled on the 1Malaysia Development Bhd (1MDB) scandal had been completely sold out.Clare Rewcastle-Brown said she had under-estimated the takeout of her 528-page book 'The Sarawak Report: The Inside Story of the 1MDB Expose' to receive such overwhelming response since the launch on Sept 8. Rewcastle-Brown said she was not concerned that people would stop reading her publication, but rather concerned that she had to request the UK-based publisher to have a third print run of her copy. "That's the kind of problems you will be pleased to have rather than the other way around," she told reporters during her book signing session at the Penang Institute, here. She added that she would be doing another book signing session in Singapore, followed by Johor. Meanwhile, Rewcastle-Brown hoped that her book would inspire Malaysians to become journalists in the future to protect the new Malaysia. She stressed that young people needed to understand the importance of journalism in keeping the democracy safe by seeking and reporting the truth without fear, even being seen as 'Public enemy No.1'. "If the journalists were under attack by higher authorities, that immediately tells them that what they have done had made an impact. Of course, there are faulty journalists, but it is much easier to deal with a dishonest and faulty journalist then it is to deal with a dishonest and dangerous government...Journalism is an exciting job, and despite not being the kind of job that will make you become a rich person, it has an enormous job satisfaction in serving your community and fighting to serve for your people," she said. The 1MDB scandal is widely considered to be a major factor in the toppling of Barisan Nasional and former prime minister Datuk Seri Najib Tun Razak in the 14th general election on May 9 this year.